A comprehensive ebook about Event Sourcing? Following my Event Storming workshop and presentation at IPC in Munich this year, several people asked me about working examples for DDD/ES/CQRS with PHP. It is great to see that those idea are catching on in the PHP community! However, there still seems to be a lack of resources on the topic. Having used and taught Domain-Driven Design/Event Sourcing/CQRS for more than five years, I thought maybe I should write a comprehensive ebook on Event Sourcing with PHP? Several people quickly replied and expressed their interest. Well, I already have some material that I can use, but as of now I am not exactly sure about where to start and where to end. What should be in the book? Only Event Sourcing, CQRS plus Event Sourcing, or even Domain-Driven Design basics? 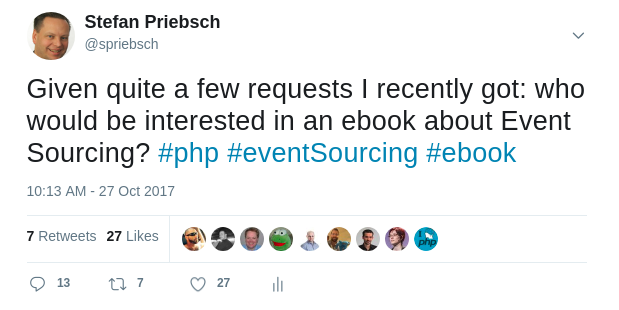 The tentative title of the book would be Event Sourcing Explained, to follow suit with PHP 7 Explained that I co-wrote, and the upcoming PHPUnit Explained that my friend and fellow thePHP.cc-er Sebastian Bergmann is working on. Help me make this book the best it can be, and share your thoughts with me. Any input is greatly appreciated. Email me, or ping me on Twitter (I am @spriebsch). And please help me spread the word by telling your friends and colleagues about this ebook.